From the many questions I get about it, I know that many readers of my site have questions about 3D scanning with depth sensors for making full color 3D prints. 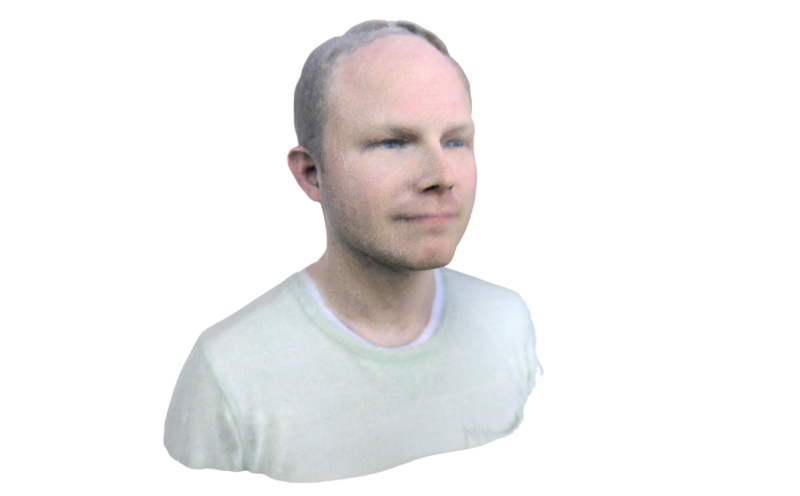 Mainly scans of people to 3D print (and sell) small scale figurines in full color sandstone. 3D scanning with the Structure Sensor (or the smilar, but cheaper iSense) is an obvious choice for this — it’s a reliable and affordable. And the combination with an iPad not only makes wireless scanning possible (which is great when scanning people, especially at events) but also delivers great texture quality because of the generally good iPad RGB camera. Many people started using the excellent itSeez3D software for this. As you can read in my in-depth itSeez3D Review that app has a great, automated workflow that delivers outstanding scans with unmatched texture quality. Hoever, many people where shocked by the fact that after a period of appearing to be completely free (in reality it was $1000 for commercial purposes), the developer behind itSeez3D implemented a new business model based on a subscription plus additional per-scan pricing above the included scan bundle. Kind of like a mobile phone contract. Including 3-full featured exports to PLY, OBJ or WRL format with all 3D Printing options like scaling, hollowing and pedestal generation! An exclusive offer worth $15! For people that actually run a 3D scanning or 3D printing business, the prices of either the Professional the Business subscriptions are probably well worth the extra benefits in workflow and automation. But for people that don’t make money (or very little) from 3D scanning, they might be steep. Up until now, there weren’t any alternatives, because the free Occipital 3D scanning sample app is too limited in terms of workflow and quality. And while Skanect has always been a great tool, it was lacking in texture quality to keep up. This changed with the update to Skanect 1.9 which I reviewed recently. Aside from a lot of under-the-hood optimization and support for recent nVidia graphics cards the focus of that update was mainly on texture quality. And as you can read in the review, it pays off — texture quality in Skanect 1.9 has greatly improved. The question I’m trying to answer in this post is: is it good enough? The Skanect version has slightly better geometry, but in my opinion that’s negligible for most purposes. If the purpose is online viewing, sharing and VR the better textures of itSeez3D make up for the generally lower quality geometry of the Structure Sensor (or depth sensors in general). However, if that purpose is full-color sandstone 3D printing — which I now many readers are doing or planning to do — the end result would really depend on the scale the model is printed at. 3D printing human busts at 10-15 cm is quite common because it keeps the figurines relatively affordable. At that scale I think the low resolution of the sandstone printing material might make the difference in texture quality between itSeez3D and Skanect negligible. As you can see much of the texture quality gets lost because of the physical properties of the material. Of course, be scientific about if there’s a noticeable difference between itSeez3D and Skanect at this scale, I have to make more controlled scans with both applications and print them both at the same time size to be scientific about it. If I do that in the future, I’ll surely update this post with the result. Skanect is just $129 with unlimited scans, but does require a separate computer (and preferably one with a decent graphics card) for best performance. If you want to scan on location, this needs to be a serious laptop and they’re easily $2000+. itSeez3D’s costs can easily surpass $80 / month on subscription plus per-scan fees if you’re setting up a professional service for 3D printing. But if you just want to share scans online and in VR through Sketchfab, it’s good to know that you can do this completely free of charge. Besides price, itSeez3D is a fully automated workflow with no manual editing options. However, the web interface allows you to manage and share your scans from the cloud while Skanect projects are stored only locally on the computer. ItSeez3D’s web interface also allows the models to be hollowed automatically and can add escape holes and pedestals based on a few simple parameters. Both features are missing in Skanect 1.9 and depending on how you calculate business costs and how expensive 3D artists are in your area the per-scan price of itSeez3D might be not be a big deal. However, while itSeez3D does a good job of producing a 3D printable model, in reality I think many professional would want to edit them anyway — both textures and surface. Especially when dealing with people, there are always some things you (or your client) want to polish. Simple things like removing blemishes or touch up other imperfections are as normal (and arguably necessary) in 3D as they are with 2D photography. This means you’ll have to edit models anyway, or hire a 3D artist to do so, before sending models of for 3D printing (or doing it yourself). And if that’s the case, doing the hollowing (and other 3D printing optimizations to the surface and texture) can be part of the job. Hi nick, i have a question about skanect 1.9 when using turntable, i enabled the hi res color option, and scan using turntable with slowest spin possible, but still i have some color missing becoming black when scanning full body scan. I actually didn’t test 1.9 on a turntable in that mode, but it probably has to do with the speed like you said. For the software to take the high-quality photo it will wait for an almost motion-less moment and with a turntable there might not alway be a moment for this. It might work if you pause the turntable when Skanect asks to stand still. I’ve put a foot switch (from a light) in the power cord of my turntable so I can pause it with my foot. I might test this with Skanect when I have the time, but not in the near future. I’d like to use Skanect to colour scan, and 3d print. I recently purchased an iSense (eBay) and find myself caught in this ‘calibration’/Serial Number not support situation. iSense App no longer available, Structure Sensor software from Occipital not supporting this iSense (based on serial number). I can scan fine (no colour) with Hacker Cable to Laptop/Skanect, but Uplink won’t work if I put the iSense on the ipad to available of colour scanning. (calibration issue/iSense not supported by Structure/Occipital Inc.). Itseez3D works ok, but for hobby purposes their charges for downloading printable files are prohibitive. If you have any advice how I can scan in colour (for printing… .obj/stl file) with an indirectly purchased iSense scanner, it would be appreciated. Tks. Color Scanning only works when the sensor is connected to an iPad. It uses the iPad’s color camera then, since the sensor doesn’t have one. You say the Stucture Sensor software doesn’t support the iSense. What app do you mean? It’s true that the Calibrator app is not supported but you won’t need that if you use the iSense with the iPad it was designed for. Please let me know if this has changed recently and no longer works. Hi Nick (Tks for prompt response). I’ll return to the equipment for specific error messages this evening, but for now as I recall my test setup, I have Skanect on my laptop, the iSense (eBay version) on the iPad with Structure Sensor software (recent version). With Skanect open on the laptop it says “…Waiting for Uplink…”. I then select the Uplink option in Structure Sensor software on the iPad. The app gives a dialog like it’s scanning the network for the Skanect software (both on same network), but times-out with message. I need to get that specific message for you. I’ll get back later with more detail on the Uplink point of failure and any messages it gives. That sounds more like a network / recognition problem. Could also be a router problem for that matter or a firewall problem on your computer. Tks Nick. Will take my trouble-shooting in that direction. Regards. There was a Windows Firewall restriction preventing the full connection of Uplink. The Uplink ‘button’ was becoming visible on the iPad when i’d open Scanect. That was indicating the wifi was ok, but puzzling me when the connection wouldn’t open properly. The error message was saying “failed to connect… Port 6666”. That suggested some Firewall restriction. Disabling Windows Firewall temporally as a test resolved the issue. I’m now able to scan via the iPad to Scanect on the laptop. Colour works also. I can play with the process some more now. I have been using Itseez3d for”and now I’m planning on doing a trade show. I have trouble using a turntable if it is too close to a wall, needless to say trade show booths are tight and in my case close to a wall. I’ve been looking at back drop kits online. So my question is could I scan up against a back drop and if so would it be better if it were white, black or green? That’s a hard-to-solve problem. The only thing that would work is very black cloth of some kind. Velvet maybe. But I’ve been impressed by the Structure Sensors ability to capture black fabrics.